The Leader, through the years. The Morrisburg Leader is a weekly newspaper which has served South Dundas for over 155 years. The Leader, as it is know, began in 1862 as the Dundas Courier. It was the first newspaper published in Morrisburg and was founded and published by Hugh Campbell Kennedy, who married Kate Holden, the daughter of James Holden. After Kennedy’s death, the paper struggled. It was purchased by Herbert H. Bradfield, in 1899. Prior to its sale it was edited for a short time by Adam Harkness. 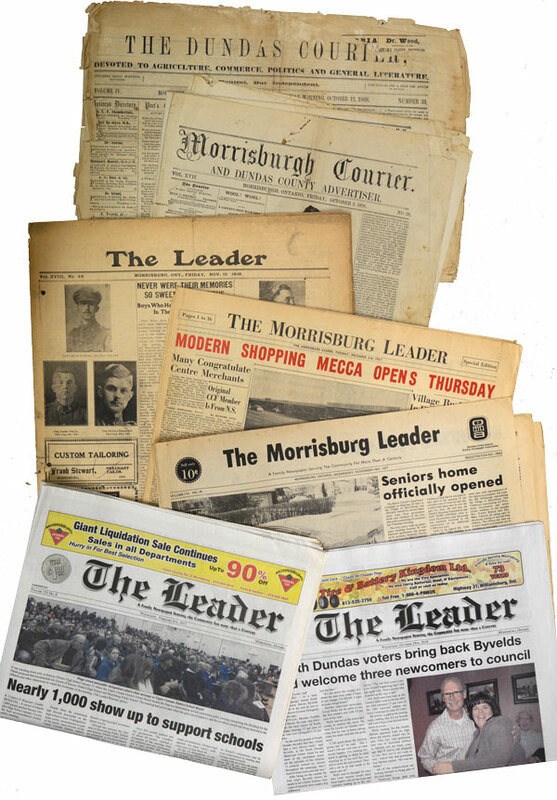 During this time the name Dundas Courier was changed to the Morrisburg Leader. In 1914, Herbert Bradfield sold The Leader to J. Wesley Allison who hired Leo Laurin as editor/publisher. In 1928, Leo Laurin purchased The Leader, and upon his death in 1938, his son Arthur became editor/publisher. The Leader relocated, along with the rest of the businesses in the old Downtown Morrisburg during the St. Lawrence-Seaway project. Since 1958, the paper office has been located in the Morrisburg Village Plaza. Today, three sons of the late Arthur Laurin – Sam Laurin, Terry Laurin and Mike Laurin continue to own and operate The Leader. The Leader publishes every Wednesday, and is located at 41 Main St., in The Morrisburg Village Plaza. The office is open Monday to Friday from 8:30 a.m. to 4:30 p.m. The Leader is a proud member of The Canadian Community Newspaper Association, The Ontario Community Newspaper Association and is independently owned and operated. This is the home of the Morrisburg Leader. Please read on and enjoy.